To send an receive email you will need an email client. Because most people want access to email from any location you will probably use several email clients. In this tutorial we look at the pros and cons of the various email clients. These types of client need to be installed on the computer that you are using,, and they need to be correctly configured before you can send, and receive email with them. If you predominately access email from a fixed location and/or access multiple email accounts then a desktop based email client is probably the best choice. 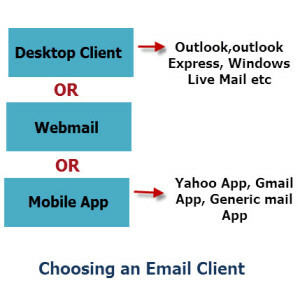 Using a desktop based client doesn’t mean that you can’t use webmail or a smart phone to access your email. Smart phones and tablets use an email App. General email Apps will allow you to access email from any email account/provider whereas service specific Apps are designed for a particular Email Provider. For example the Yahoo Email App is designed to Access Yahoo email. Apps need to be installed on the device that you are using,, and they need to be correctly configured before you can send, and receive email with them. Using a smart phone based client doesn’t mean that you can’t use webmail or a desktop based client to access your email. These clients are simply web browsers with all the work being done on the web server. Hotmail (now outlook.com) was the first well known example, and was purchased by Microsoft January 1998. The advantage of this type of client is that no software other than a web browser needs to be installed on the user’s computer or smart phone/tablet. However using public computers with Webmail is not advised due to security implications. Because almost all computers and smart phone/tablet have a web browser installed, it means that access to email can be accomplished on any device. Almost all email providers now provide access to email via a web based client. The main disadvantage of this type of access is you need to be connected to the Internet in order to read/write emails. Webmail was probably the most used method of accessing free email providers like Gmail,Yahoo Mail and hotmail. However due to the rapid growth of smart phone and tablet usage many are switching to using a combination of desktop client in the home/office and smart phone App when travelling. Before you can send,receive and manage emails you may be required to do some initial client or App setup. SMTP server– This sever is used to send email. 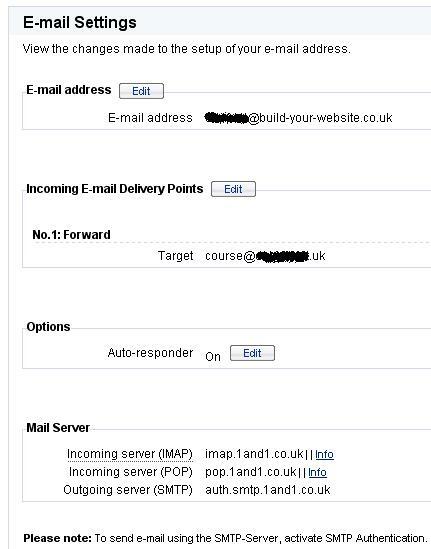 POP3 or Imap4 server-This server is used to receive email. Account name – This is your login name to receive email. Account password -This is your login password to receive email. Most of these details will be provided by your email provider,but some you will need to decide yourself (e.g. password, email address and Account name). The screen shot below shows how 1and1.co.uk provides these details. You should notice that to send email using SMTP you will require authentication. This normally uses the same name/password combination as for receiving email. If you use a web browser to access your email then you don’t need to worry about sending/receiving protocols and setup. Tip!– Create a bookmark or desktop shortcut to make accessing email easier. I use a desktop email client current Windows Live Mail), on my PC , and an Email App on my tablet. I did try using Webmail as my main access method but didn’t like the fact that I needed to deal with different interfaces and logins as I manage multiple email accounts. Most casual email users tend to use web based clients on PCs and Laptops, but an email App on smart phones/tablets. The following table represents what I consider to be the best client based on usage. There are three main types of email client that you use for sending and receiving email. Each email client has advantages and disadvantages and most people will use several email clients. Webmail was probably the most used client for accessing Yahoo Mail, Gmail and Hotmail but because of the rapid spread of smart phones, and tablets Email Apps are becoming more popular.